Franklin Else Bandstand, a gazebo style bandstand, is located in the center of downtown Lake Mills, in the 3.7 acre Commons Park. Also on the site are two monuments and in the winter, an ice skating rink draws many. Else was the director of the Lake Mills City Band from 1932-1970 and a Lake Mills Public School Music Teacher from 1932-1975. The bandstand was dedicated in 1994 by friends and citizens of Lake Mills. His love of and dedication to music are remembered by all whose names, as donors, are listed and displayed at the L.D. Fargo Library, which is located across from the park. In 2013, it was determined that the bandstand needed considerable repair. A group established "FixIt4Franklin" for the $100,00 bandstand renovation. On June 6, 2018, the bandshell celebrated a rededication after a top to bottom makeover. This effort took five years not only to assess what was needed but to raise the funds. Perseverance, determination, and hard work paid off, and the result is that it is now in tip-top form for many years to come.. 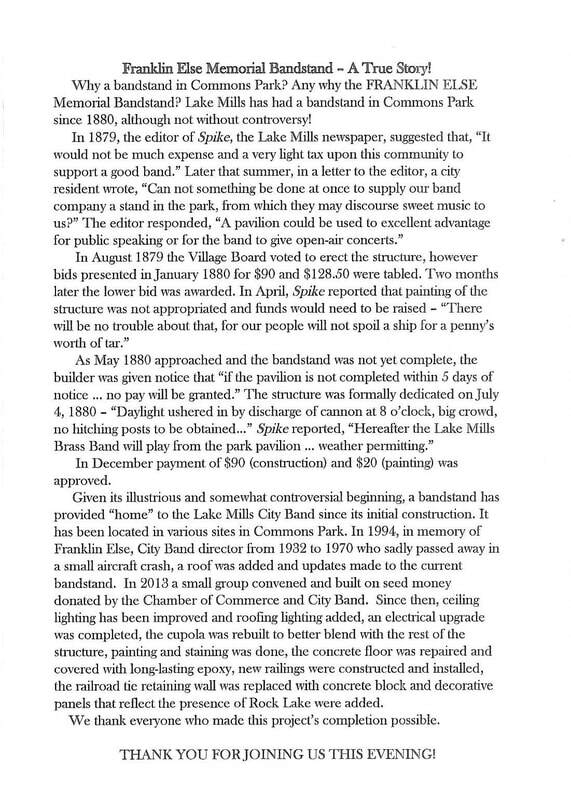 In 2014, an engineering analysis was completed, paid for by the Lake Mills City Band ($5,000) and the Chamber of Commerce (($1,000). With that in mind, fundraising started. Improvements include LED lighting in the ceiling (musicians had trouble reading music with the old lighting), lighting to accent the cupola in the evening, better electrical service, resurfacing the flooring which had become pitted over time by WI weather, painting, new stairs to the stage area, new signage at the base, and removing the timber landscaping surrounding it and replacing it with a tiered brick structure. The 940WFAW website article by Gary Douglas describes in detail the complete process of the rehabilitation and the rededication of the Franklin Else Bandstand. Many summer concerts are scheduled at the bandstand; each concert is supported by various groups in the community. Besides the talented Lake Mill City Band, the other "pièce de résistance" is the artwork created by Karen Crosby, a local artist, who designed 12 panels that embrace the stage of the bandstand. Named "The Spirit of the Lake", they are made of powder coated steel and have cutouts, reminiscent of paper cutting, that reflect the life forms of Rock Lake. Here are just a few of the panels.